Banners By Apple Graphics Inc. Banners are a great affordable way to advertise any event, company or promotion. Apple Graphics Inc. can do anything to meet the needs of any customer. There are endless possibilities with banners, they come in all different shapes, sizes and can be customized for any occasion. Apple Graphics Inc. has the resources to make banners as large as billboards, and on lots of different materials. Banners can be used for birthday parties, business events, lunch-ins, dinners, weddings, holiday parties, or even just personal use. Apple Graphics Inc. can do all types of banners such as, Pop up banners, Digitally printed Banners, Vinyl Banners, Grand opening banners, Mesh Banners, Wall banners, School Banners, Double Sided Sewn Banners, Holiday Banners, Table Banners, Window Banners, Feather Banners and lots more. Above are some examples of banners, the top left was a 6x10ft banner made for Stutz Candies, to advertise for their Easter candy selection. 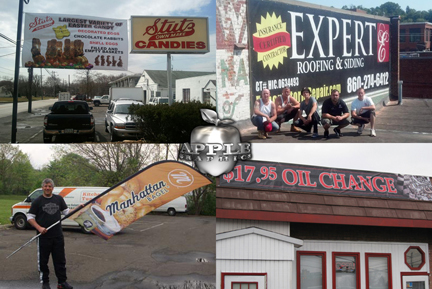 Top right is a Billboard sized banner for Expert Roofing and Siding, this is a great way to get your company recognized by lots of people. Bottom left is a feather banner made for Manhattan Bagel, this banner grabs the attention of people driving past the shopping center, so they know there is a Manhattan Bagel nearby. Bottom right is a banner at a local garage, this long banner on their roof lets their customer know their great low price for an oil change.